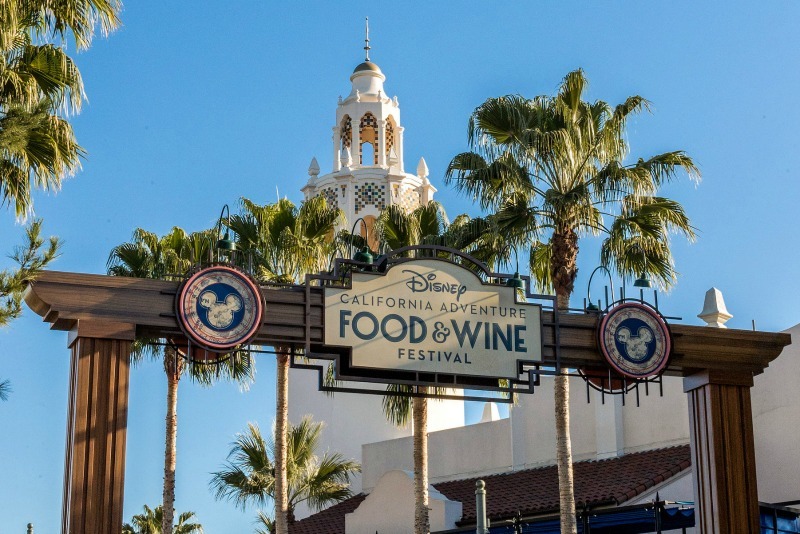 The Disney California Adventure Food & Wine Festival is in full swing at the Disneyland Resort for 2019. The festival runs this year from March 1 until April 29 – longer than ever before. There are a record 14 festival marketplaces serving foods and drinks with California grown ingredients – everything from garlic to avocados to plenty of wine. The signature experience for kids at the Disney California Adventure Food & Wine Festival is Jr. Chef with Goofy. 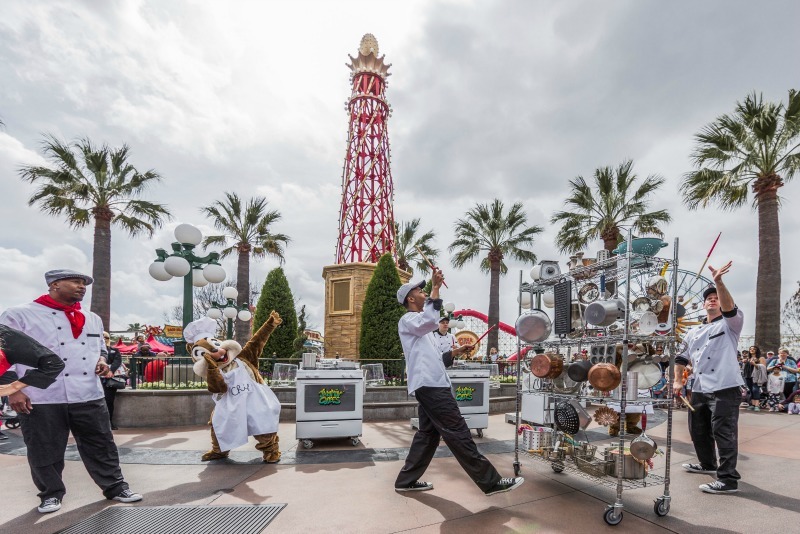 In this stage show on the Hollywood Backlot, kids ages 3-11 mix ingredients and bake cookies with Goofy’s help. Disney magic bakes them for a sweet treat at the end! There are usually 3 showtimes a day, so definitely adjust your touring plans to accommodate one of these times. We recommend arriving at least 30 minutes in advance to get a spot, as advance reservations are not available. Up to an hour may be necessary on the busiest crowd days, such as Easter week. 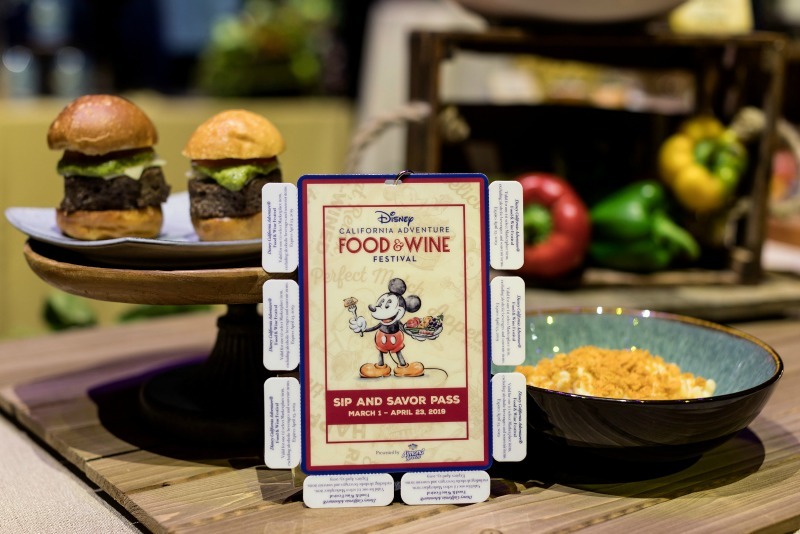 This 2019 year marks the first occasion when the Sip & Savor pass has been available to everyone visiting the Food & Wine Festival. Previously, it was a benefit for Annual Passholders only. So what is the Sip & Savor pass? For just $54 ($49 for Annual Passholders), you get a pass on a lanyard that entitles you to 8 food or non-alcoholic drink items. You’ll save money using this pass over ordering most items a la carte, so it’s a great value. Additionally, 8 dishes is probably about right for a family of 4 to share for a single meal so it works well for family groups. The Food & Wine Festival features plenty of entertainment, but the Jammin’ Chefs should be on the top of your list for visiting with kids. This group plays pots and pans like they are musical instruments, with Chip ‘n’ Dale along for the fun. There’s dancing and audience participation opportunities for kids. The short show (10-12 minutes) plays about 6 times a day in front of The Little Mermaid – Ariel’s Undersea Adventure. If you have a picky eater in the family, some of the food items on the festival menu may simply have too many ingredients for your kids to like them all put together. But there are definitely modifications that you can make on some of the dishes to make them more palatable for your kids! The food is assembled for you after you approach the pickup window, so you can always ask the cast member to leave off certain toppings if you think they might make your kid balk at the food item. For example, it’s easy for a cast member to leave the garlic breadcrumb topping off the mac & cheese at Garlic Kissed. Or perhaps you want to try the Harris Ranch beef slider from Cluck a Doodle Moo without the pickled onions. Just ask! No one needs another long line on their Disney vacation – especially not families with young kids when everyone’s hungry. Luckily, this year’s Food & Wine Festival makes it easy to sail around that problem. You can now order food from any kiosk. Find the one with the shortest line, order food there from the others, and take your receipt to the pickup window of the appropriate kiosk to get your food. Food & Wine Festival Giveaway!